other Civil Services Recruitment through Prelims Examination. 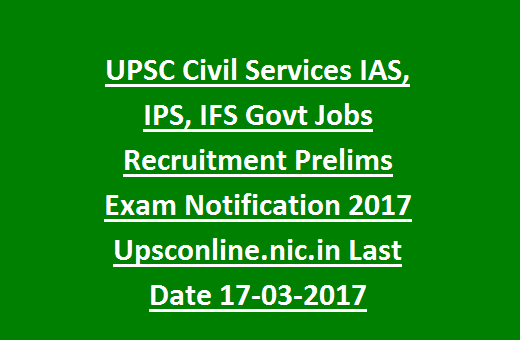 details of UPSC CIVIL SERVICES IAS, IPS, IFS Jobs Recruitment see the information given below. Starting date for online applications: 22-02-2017. Closing date for online applications: 17-03-2017. Civil Services Prelims Examination date: 18-06-2017. Civil Services Mains Exam Date: 28-10-2017. There are approximately 980 vacancies available in 24 departments of Civil Services UPSC recruitment. List of vacancies are given in UPSC official notification. Science/ Arts/Engineering from any Indian recognized University. 01-08-2017 (must have born in between 02-08-1986 and 01-08-1996). and up to 3 years to OBC Candidates. using Debit/Credit card/ Net banking before 17- March- 2017. UPSC Preliminary Examination consists of two papers. Paper I: 200 marks- 2hrs. Paper II: 200 marks- 2 hrs. , Public Policy, Panchayati Raj, Rights Issues, etc. the Part 1 registration process and then proceed for Part 2 registration.